Artistic, informed care reflecting the tree’s needs and characteristics and your wishes. The key word here is informed. That is, pruned with the understanding of the genetic propensities of that specimen- not merely how does it look when finished, but what will be the result of today’s treatment one year later? Two years? Five? Trees at a never stop growing. Knowing which tree requires what care is where our experience pays off for you. 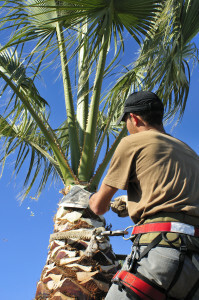 And while we prune for the future, a properly pruned tree will look natural when the trimming is finished, not mutilated. Please don’t. Almost without exception, “topping” a tree to an arbitrary height is a prescription for long-term problems. While we frequently head back a tree at the top, this must be done with regard and concern for the crown formation of the canopy. Simply removing everything on a tree above a given height due to concerns that the tree is “too tall” and therefore unsafe is a recipe for inferior re-growth, an invitation to interior rot and a prescription to increase the tree’s hazard factor, not to diminish it. Some trees, especially those that have suffered from previous inexpert care, may require the installation of cables or braces to diminish the likelihood of catastrophic limb or trunk failure. Any honest arborist will tell you that a crutch or a cable cannot guarantee safety, any more that seat belts and airbags completely insure against harm in an auto accident. However, cables, bolts, braces and crutches are frequently utilized to bring a measure of safety and control to bear on a given tree. We use EHS cables, a type of thinner yet stronger cable which provide an extra measure of security while presenting a more discreet silhouette. Often trees must be removes altogether. Their roots may be threatening a foundation or invading plumbing, there may be issues of tree illnesses or death, the tree may be on balance a liability rather that an asset. With the best of intentions, people plant the wrong tree in the wrong location and it has to be removed, We pride ourselves in our ability to move literally tons of weight and mass out of the sky and into our truck without harm to the garden below or the house alongside. It’s complicated, noisy work requiring skill, experience and hard physical labor – and we love it. Getting your tree off to the right start is half the battle. With our years of expertise, The Urban Lumberjack can assist in choosing the proper type of tree, selecting and purchasing the most promising specimen as well as transporting and planting the sapling into its new home – your garden. 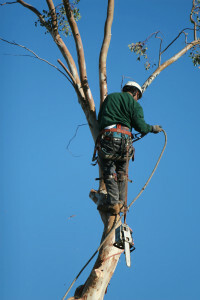 Call The Urban Lumberjack (323) 664-9473 or contact us here to inquire about our tree services.